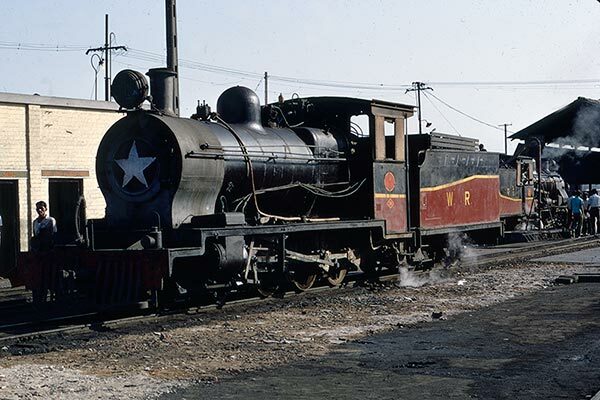 Caption - Western Railway (India) 2-foot 6-inch gauge P class 4-6-0 no. 605 is seen at Dabhoi loco depot in April 1971. Built by Bagnall (2376/1929) for the Cutch State Railway, the loco carries no.8 which was its original number when delivered. At this time Dabhoi was one of the busiest narrow-gauge loco depots in the world and in the background can be seen one of 32 ZB class locos allocated here which were supplemented by two B class 2-8-4Ts, three C class 2-8-4Ts and three P class 4-6-0s.